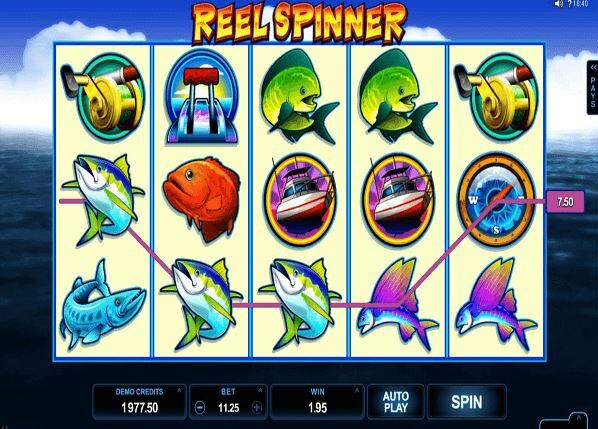 Reel Spinner Online Video Slot powered by Microgaming has five reels, 15 paylines, five different types of colourful fish to catch, and all sorts of fishing equipment. It has wild symbols and scatter symbols and it also has an exciting Free Spins feature in which you pick a boat to reveal the number of Free Spins and spin the reel to reveal the multiplier. The wild replaces all other symbols except the scatter. If you land three or more scatter symbols you will trigger the free spin feature and win up to 20 free spins at up a 5x multiplier in the bonus feature. During stage one of the bonus feature, players must select a boat to reveal the number of free spins awarded, Each boat awards a different number of free spins. During stage 2, players must spin the reel of the bonus feature to reveal the free spins multiplier. Wilds are stacked on all reels during free spins.The bonus feature cannot be retriggered.